Worship at Christ Community includes proclamation of God's grace through reading of scripture and preaching, sharing in the meal of holy communion, praising God through song, and prayer. Children of all ages are welcome in the worshiping community. 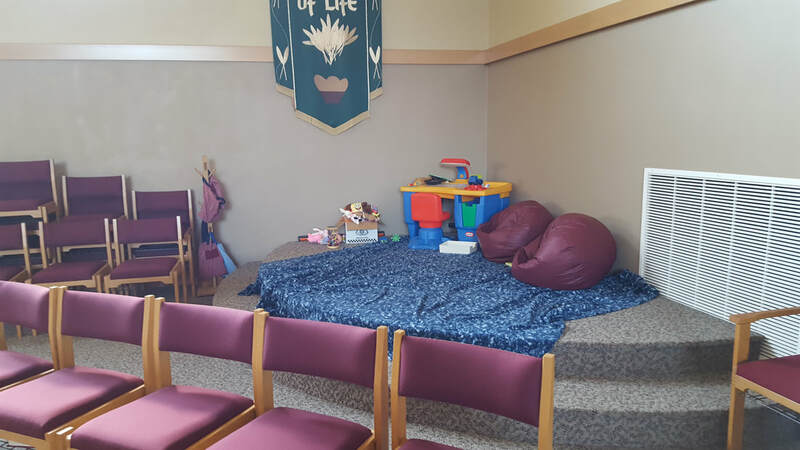 Our "prayground" is a safe space for young children to experience worship from their own point of view. Children's bulletins are available and our library serves as a cry room on Sunday morning. All are welcome at Christ's table, whether you are member or visitor. We use gluten free bread, and both wine and grape juice are available. All ages are welcome to commune or come forward for a blessing. We believe one of the ways that we hear the Word of God is in the reading of the bible. In worship, we hear from several different biblical texts. Through the sermon and congregational song, we proclaim God's love and mercy for all creation. Our musicians lead us through a variety of styles and types of worship music from hymns to praise songs. Anyone who would like is welcome to join us for rehearsal before worship. Following worship, we gather for fellowship, spending time in relationship with each other, building on the connections we make during worship as beloved of God. Musicians, ushers, communion assistants, and readers serve God through helping lead the worship service. Greeters, altar guild members, and refreshments organizers serve God through helping prepare for worship. Our committees and visions teams are always open to new voices and ideas. For more information, contact the church office or the pastor.